A Pheasant Permit is required for hunters 16 years of age or older hunting on an adult license, in order to hunt or possess pheasant in Cumberland & York counties. Revenue derived from this permit is dedicated to the acquisition of pheasants which are raised and released by private fish and game clubs. A Coyote Night Hunting Permit (valid January 1 to December 31, and available for $4 plus agent fee) allows the permit holder to hunt coyote at night (defined as 1/2 hour after sunset until 1/2 hour before sunrise) from December 17 to August 31. Hunters must be in possession of a predator calling device (electronic, hand-held, or mouth-operated). The use of artificial lights to hunt coyote at night is permitted. The use of dogs to hunt coyote at night is prohibited. In addition, the commissioner may appoint agents to hunt for coyotes at night using artificial lights from September 1 to December 15. The commissioner shall make affected members of the public and law enforcement officers aware of any night hunting operation. A falconry license, in addition to a regular hunting license, is required of persons who engage in falconry. Copies of the regulations pertaining to this type of hunting are available upon request. To obtain a falconry license, contact MDIFW. Crows are neither migratory waterfowl nor migratory game birds. The use of lead shot and shotguns capable of holding more than three shells is permitted. A migratory waterfowl stamp is not required. 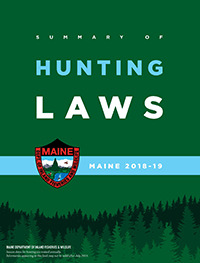 See Laws Pertaining to Hunting Equipment for information on the use of crossbows. * In York and Cumberland counties, a permit is required to hunt or possess pheasant. Permit is not required to hunt or possess pheasant throughout the remainder of the state. ** Bobcat taken by hunting must be tagged within 72 hours of harvest.